I am loath to report that we are stranded, now mired to the gunwales in the bottom ooze – and I have only myself to blame. The accident occurred in the middle of a strategizing meeting with naturalist Lyra Saunders and engine master Barron Wolfe. They were elucidating me on their well-reasoned plan to modify Cyclops’ fuel production by utilizing the product and by-product of photosynthesis (starches and oxygen) to fashion a fuel supply that would be emission-free, resulting in no carbon excess, making us undetectable to the predators of the pond micro verse. 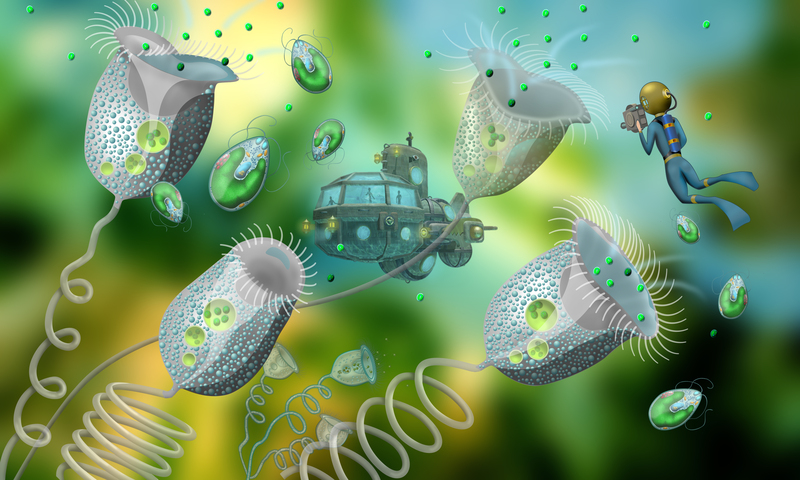 As proposed, our menagerie of green algae cells, which has provided the bulwark of our oxygen production, could also be utilized as a starch farm. The starch would be processed to make a clean fuel for the boiler. 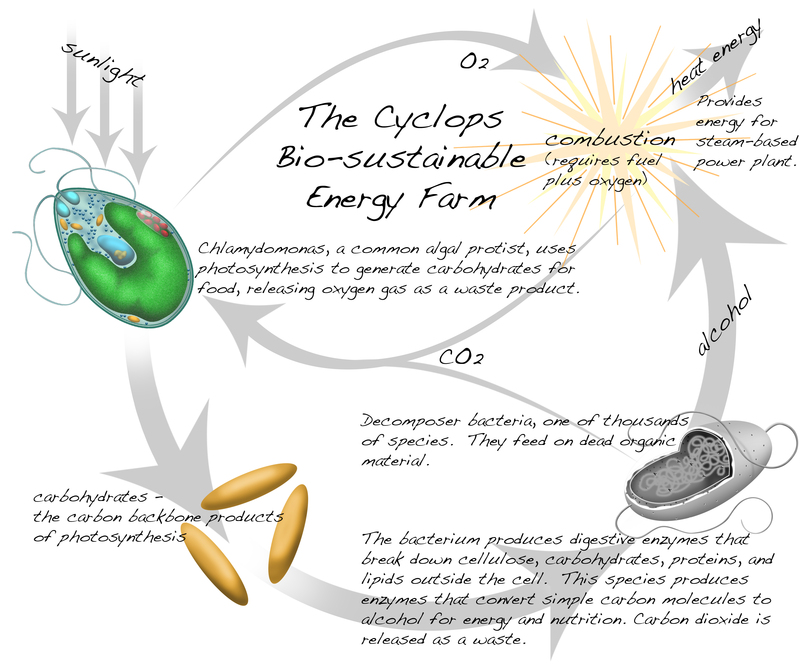 Combustion would provide heat to drive the turbine, and the carbon gas waste product channeled back to the algae cells, which with the addition of sunlight, would continue the cycle. The idea was nearly perfect… the single stumbling block being that we had yet to discover how to easily convert the starch, which was itself combustible, to a higher energy-yielding fuel. We were, in fact, discussing this very issue when there came a loud report, a metallic ‘BANG’ from aft. The interruption hung for a moment in the cabin air as we looked at each other with a range of expressions, puzzled to concerned. “Skipper, better get up here…” came Gyro’s stern declaration over the voice pipe. Barron was bound for the engine room without a word. I raced for the wheelhouse, Lyra at my heels. In that moment I knew I had been remiss: following our run-in with the planarian, and more recently with the hydra – both of which were taxing to the ship’s constitution – I should have ordered a stem-to-stern inspection. But I neglected to do so, caught up in the excitement of new discoveries, and now some important piece of equipment had failed. We charged into the pilothouse, found Gyro clutching the ship’s varnished oaken wheel with his left hand, his right pulling futilely on the elevator control lever. Yes, I thought with alarm and self-recrimination, something that likely would have appeared plain as day in a cursory inspection… if only I had ordered one. The following moments are a blur… of alarm bells… of desperation to regain control… of the pond bottom rising up from the shadowy depths as Cyclops plummeted deeper and deeper. “Hang on!” shouted Lyra, but her warning was unnecessary. My knuckles, bone white, were locked around the safety railing in an iron grip. Around us, water roared past the observation panes with the sound of a hurricane. Ahead, the terminus of our steeply sloped path loomed with ever-increasing detail. And then we met with the bottom. Iron howled, steel screamed, wood trembled. Cyclops’ downward motion was turned into forward motion in an instant, and momentum threw me over the railing and into a forward pylon separating two glass panels. I lay on the deck, looking up at the glass panes through which a dense cloud of bottom detritus was roiling around the ship – but to my surprise, no collision came then or ever. The bottom, it turned out, was soft as goose down. 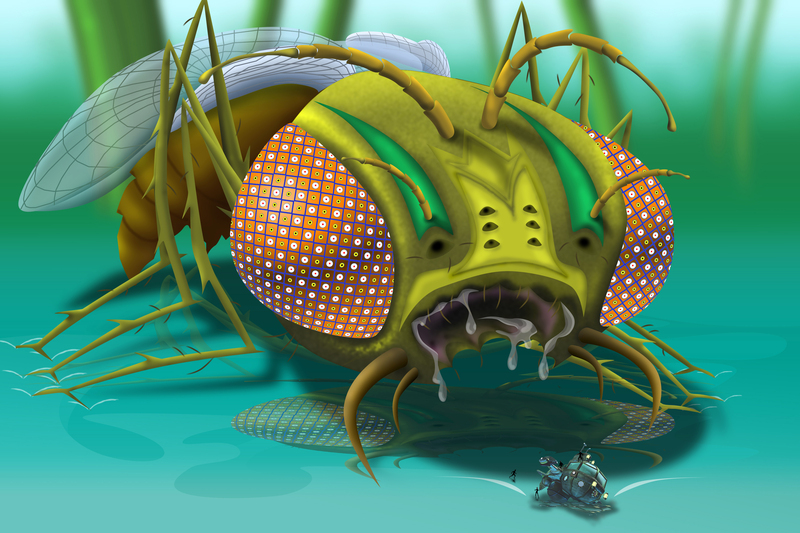 Cyclops came to rest on a vast pillow of spongy ooze – the term given to the bottom micro habitat: a layer made up of dead plants and animals that rained down from the upper levels of the pond, home to the tireless decomposer organisms that constantly converted organic matter back into basic molecules for re-entry into the food chain. As the cloudy water cleared from around the stranded ship, our immediate surroundings became perceptible in the murky light. The motionless silhouettes of hulking dead micro crustaceans littered the bottom-scape to the edge of visibility, like monstrous prehistoric invertebrates transformed into mountains. Periodically the body of a daphnia, or copepod, would drift down from above, land amongst the carcass-littered bottom with a small puff of cloudy detritus. Lyra begrudgingly accepts my clumsy change-of-subject, and turns to greet Gyro and Barron. The crew and I have gathered in the lower deck laboratory to assess our situation. We are in one piece, thankfully – more a tribute to Cyclops’ stalwart construction, than any clever action taken by her skipper. We have survived our ungraceful landing with only minor structural damage. To avoid another oversight like the one that now finds us stranded on the pond bottom, I have ordered ship-wide inspections of all mechanical systems. Engine master Barron has already begun repairs on the damaged elevator control cable that put us here, and as he enters the lab reports that repairs will be complete in half a day. But a larger problem looms. A storage tank was ruptured in the crash and the last of our fuel oil is all but gone. For a moment there is silence, then, as our hearing adjusts to the quietness, a rustling, brushing sound can be heard coming through the hull. Barron inserts a handle into the shuttering mechanism and slowly cranks the shutters open. The porthole reveals the source of the strange scraping and sliding sounds we are hearing: a microbe, about the size and shape of a large watermelon, is pressed against the glass. Beyond the cell, to the limits of sight, tens of thousands, no, millions, of other similar microbes litter the pond bottom. Some twist and writhe, moving by way of flagella or finger-like projections, others lie still in layer upon layer of identical microbes. The world of the pond bottom is a world swarming with a fantastic diversity of bacteria! “Well that explains the CO2 levels! “ A glimmer comes to Lyra’s eye. “Jonathan, “ she begins, but I stop her. “You most certainly are not going out there,” I announce firmly. The others cease their duties and direct their attention to us to see if Lyra is going to press me with one of her entertaining justifications for going out for a dip. With the use of a manipulator claw, capturing one of the plentiful cells was not difficult. 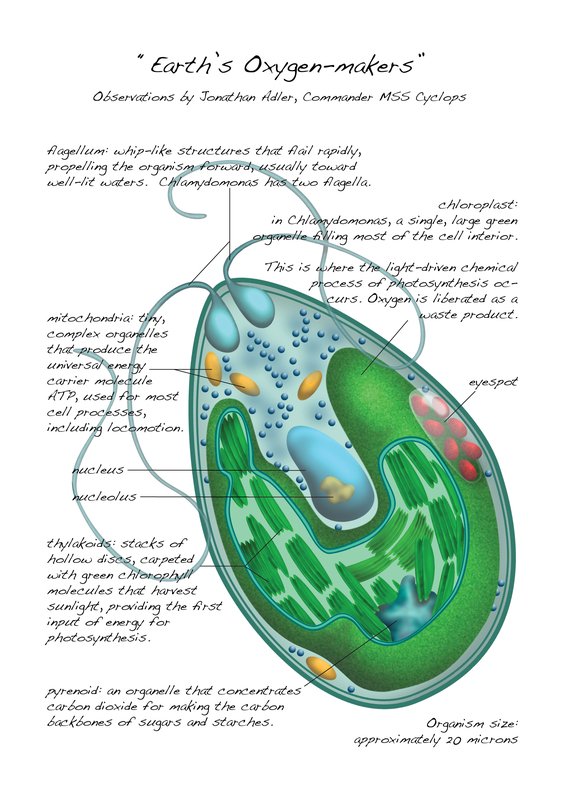 The cell’s shape is oblong, and has a lazily whipping flagellum at each end. It is now bathing in our examination tray, a large raised rectangular tub about the size of a large dining table. The bath is filled with pond water and the bacterium is idling near one end, its flagella occasionally disturbing the surface with a gentle rippling sound. 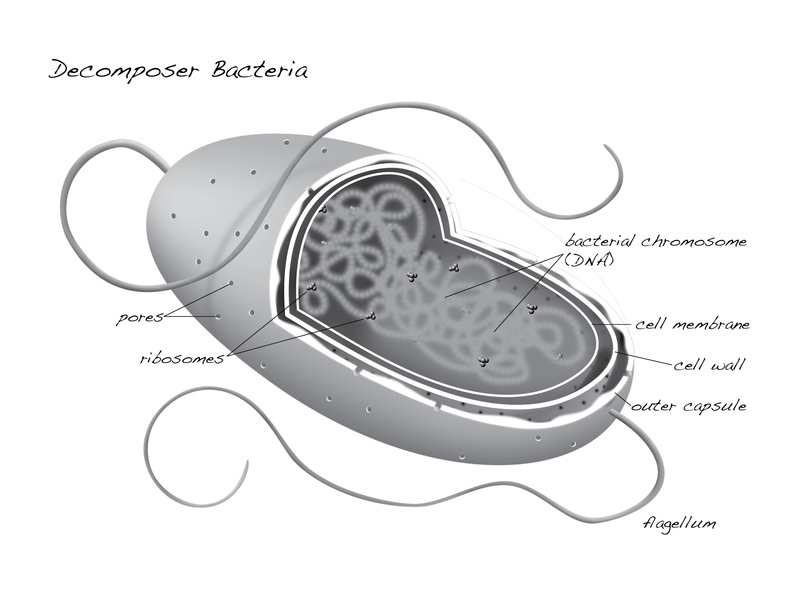 Initial observations: The cell appears much simpler than previously studied microorganisms, such as the ones we have been tending for oxygen production. Unlike the more complex single cells the bacterium has no nucleus, and very few internal organ-elles, just a few fuzzy bundles inside a gelatin-like cloud. Another difference from other single cells is the presence of a semi rigid wall surrounding the bacterium’s cell membrane: a cell wall, which we theorize serves as a protective shield from harsh environmental conditions. “Such protection might allow bacteria to thrive in some of the most inhospitable places on Earth,” I conclude. To our astonishment the bacterium appears to have a destructive effect on our examination pool! “Curious… what is the tray made of?” I ask. “We need a closer look,” I say as I swing a magnifying view lens over the affected area of the try. Using a low flame of diatom oil, a coil of copper tubing, and a beaker filled with sample water from around the bacterium, Lyra has fashioned an effective still. She is about to test the product, a clear fluid in a glass phial. She inserts a cotton wick into the phial and sets a burning match to the end. It flares brightly with a clean blue flame… the tell tale sign of alcohol. Working tirelessly into the night, Barron has been modifying the boiler to burn alcohol, which will allow steam to generate faster, while requiring substantially less fuel than before. Meanwhile, Lyra, with my assistance, has collected two-dozen of the fermentation bacteria, and has moved them into culture tanks where they will convert starch from our green algae cells into alcohol. We are expending the last of our now obsolete oil reserves to fuel lamps set around the algae pens, so that photosynthesis can kick-start the process. By morning we should have enough pure distillate to fire up the boiler, work up a head of steam, and resume our voyage. At the approach of eight bells, I retire to my small, corner study and set about organizing the various logs and journals of the past few days. As I stow an etching of the captured bacterium and an accompanying diagram of the chemical process by which we now power the Cyclops, I reflect on how our new system, a renewable system, so perfectly echoes the cycles of matter and energy in the living world. I have come to the inescapable conclusion that bacteria provide perhaps the most important role in life’s grand saga. They are the never-ending recyclers of nutrients – tireless, ubiquitous. These simplest of living things break down dead organisms, then become food themselves for larger single cells. And those become food for larger organisms yet. Down here in the shadowy murk of the bottom ooze, we have discovered the beginning of a food chain. As I gaze out my small porthole into blackness, lost in the elegance of Earth’s living cycle, a shape momentarily appears in that encircled frame – but my mind cannot comprehend it, its form or its very presence, until the shape, a moment later, vanishes from sight. It was… though I can scarcely pen the words… a face. This entry was posted in aquatic micro life, Novel Blog, wetlands ecology and tagged adventure, bacteria, microorganisms, microscopicmonsters on September 20, 2018 by Eric. Last night passed, at least for myself, with little sleep. Slumber was kept at bay by a mind overly occupied, pondering the dilemma we now face of generating steam to drive our engine, but doing so without emitting carbon gasses. We’ve learned from our observation of single-celled pond life and from our recent run-in with the flatworm, that most aquatic microorganisms have the ability to detect the presence of CO2 – the universal product of aerobic respiration. These organisms are adept at locating prey by following a trail of carbon dioxide – an ingenious evolutionary adaption. Our own engine, which burns oil to generate heat, to in-turn boil water for steam, has the same effect on predators. I am amazed that we aren’t now digesting in some micro beastie’s belly! I am faced with the inescapable conclusion that it is only by luck and fast-thinking that we have avoided such a fate. Surviving these encounters has given us invaluable observational data, and I now feel that we better understand how organisms locate prey, and how carbon dioxide plays a role in photosynthesis and respiration. Therefore it is imperative that we find an alternative source of fuel that when burned, won’t smell to the lions, tigers, and bears of the microcosm like the sound of a dinner bell! I have just announced my new directive to the crew, and I am pleased to report that they are wasting no time seeking a solution. There is a general consensus that the only way to produce heat without a carbon waste product is to fashion a closed system requiring little more than sunlight. “And starch, like sugar, is made up of carbon molecule chains. You might be onto something there,” rumbles Barron. “Not bad for a biologist,” he adds with a wink. With affirmations from each, Barron and Lyra disappear through the companionway. “Aye sir,” answers Gyro, then relays the message for all hands to take their stations. 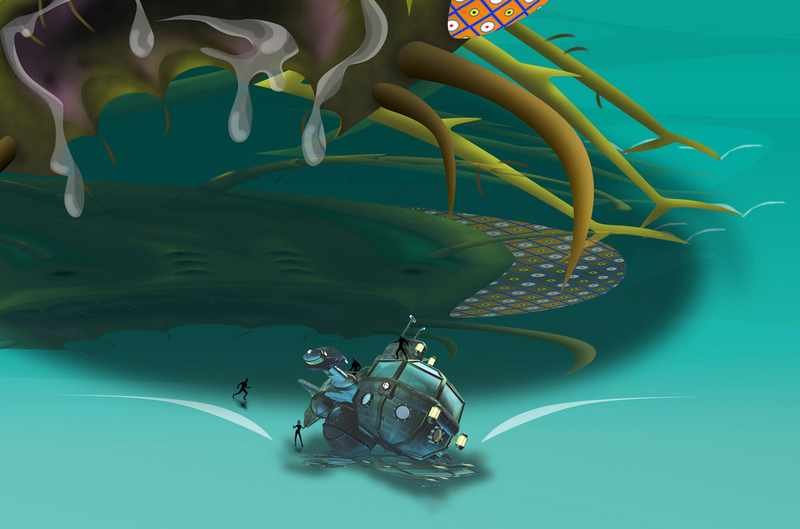 The ship rocks gently to port, then to starboard, as Gyro weaves a path through the monstrous plant stems, ever closer to the deeper pond region where the aquatic jungle gives way to the open water. My awareness is keen and my apprehension remains high as long there is danger of encountering another predator of the weedy shallows, but outside, the forest is beginning to thin, and my concerns along with it. At our current cruising depth, about twenty centimeters, sunlight from the surface is increasing. 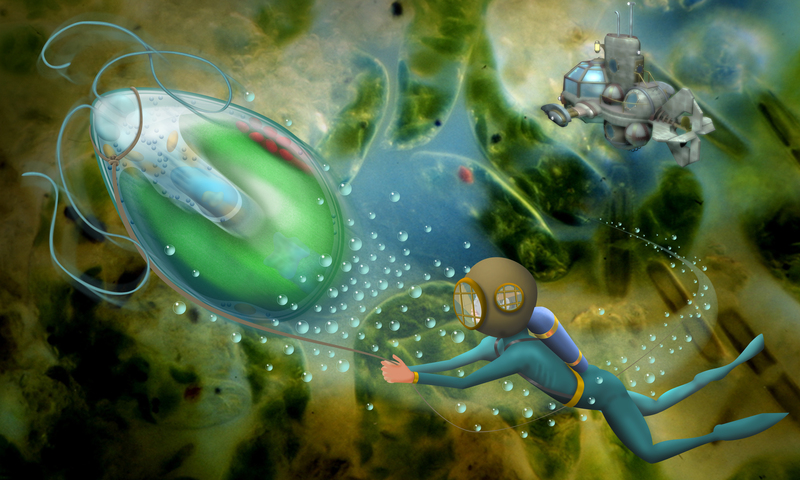 Green microorganisms streak past the ship. Through the panes of the observation dome I watch the enormous trunks and branches of the aquatic weeds pass astern, every verdant surface abuzz with microbial life. Larger organisms, so distant as to be discernible only as blurry shadows, dart in and out of awareness. We are almost clear of the forest, almost free from the worry over monsters, when the hand railing slams backwards into my mid section. The panes of the observation dome skew suddenly to starboard as the outside world tilts on its ear. Cyclops comes to an unceremonious stop. Metal groans. A complaint of our engine vibrates up from below decks. Gripping the rail to keep myself from tumbling across the pilothouse, I scan our surroundings to fathom some inkling as to what has interrupted our escape from the weed forest. It is as the aquatic jungle refuses to let us go. Before I am able to cast a whispered curse at these perilous weedy shallows, a fleeting shadow of a tendril passes over the watery light above us. Lyra stumbles from the companionway looking like her trip up from the lower deck laboratory was unusually difficult. “What happened?” she shouts over the protest of iron and wood. “Answering ahead, half speed,” acknowledges Gyro, then pulls the lever on the engine telegraph. The deck slips beneath my feet as the ship lurches forward for a breath – then stops. “It’s like we’re trapped,” declares a frustrated Gyro. I turn my gaze to the aft panes. Beyond Cyclops’ tail assembly, a mouth surrounded by six tentacles looms far too close for comfort. Four of those limbs are now wrapped tight around the hull of our ship, and are pulling it closer and closer toward that ring-shaped mouth. As if to emphasize her warning, the hydra’s tentacles tug decisively on the ship. All hands braced themselves as Cyclops lurches half a ship’s length toward the animal’s sphincter-like maw. For a moment I can feel momentum pressing me backwards as the sturdy ship drives forward, then a sudden braking as the hydra’s arms reach full extension and responds by pulling us back towards the animal’s mouth, now closer than ever. “Barron, more power!” – I bark into the voice pipe. But I know that our engine is already laboring as hard as it is able. I reluctantly turn to Gyro, nod, and watch him ease the engine telegraph level back to half speed. 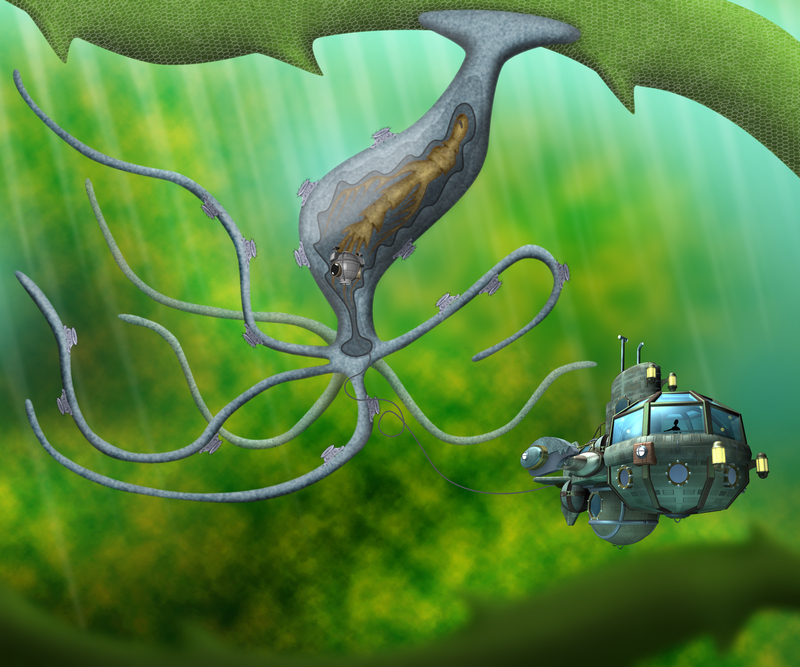 The hydra’s tentacles pull us a full ship’s-length closer to its mouth. “If this doesn’t work,” I say, “then we are going to get an amazing view of the inside of a hydra’s gut.” As I speak these words, I have no idea of how prophetic they will turn out to be. The animal has rotated the Cyclops so that we are now being pulled headfirst toward its mouth. We stare helplessly down the gullet of the hydra, namesake of the many-headed serpent of ancient Greek mythology, a fictional beast that is no more frightening that the real one we currently face. With its next contraction, the monster will pull us into its craw, which even now, is stretching wide to accommodate Cyclops and her crew. With the zap of electrical current, the lights of the pilothouse dim. Ozone stings my nostrils. Outside, strings of wavy lightning do a worm-like dance across the hull. The hydra’s tentacles maintain their coiling grip for a count of one, two, three…and just when I start to accept that our plan has failed, the tendrils loosen, jerk back from the ship, leaving Cyclops drifting freely. Hiding beneath a aquatic plant leaf we observe the hydra, now safely beyond the reach of its tentacles. There is so much we do not know about this monster. We may not have another opportunity like this one for detailed observation. Closer magnification through my telescope reveals some unusual movement on the creature’s skin. Then we see them – single-celled organisms cover the hydra! These disc-shaped single-celled organisms are ciliates, adapted for living on the hydra’s skin. 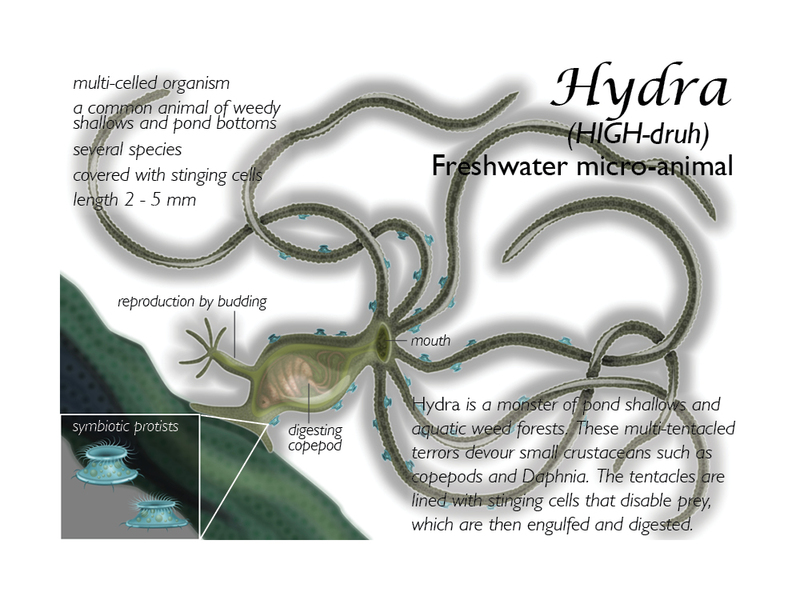 They use their cilia to create feeding currents for pulling in bits of food, and for walking and hanging onto the hydra. How, we wonder, does a baby hydra become home to these partners? Which begs the question: where do baby hydras come from? What luck! We have just seen a nearby hydra capture a red copepod. The crustacean’s battle to escape hydra’s tentacles is short-lived. The unfortunate copepod struggles for a moment, then becomes still. We gaze upon the drama with open-mouthed fascination as the utterly immobile copepod is drawn into the hydra’s mouth…alive. “What are you suggesting,” I inquire with no small degree of apprehension. Lyra suggests a daring mission, bold even by her usual standards of recklessness, but I listen with interest. “I’ll take the diving bell, and anchor it to the copepod’s carapace, and get a free ride right down into the hydra’s gut!” she explains with unbridled glee. “Oh, nothing crazy about that idea,” mutters Gyro. I have to admit: this was an unprecedented opportunity to observe how the hydra digests its copepod dinner. I know that the diving bell is a sturdy vessel, so I grant permission for this bold venture. It took Barron the better part of an hour to equip the diving bell with the necessary equipment for Lyra to effectively monitor conditions inside the hydra’s gut. Now we watch with with no small measure of uneasiness as the hydra completes its devouring of the live copepod – and anchored to it, our diving bell with Lyra tucked inside. What an incredible opportunity! Surrounded by the safety of the diving bell, I am now inside the hydra’s gut! Following the complete engulfment of the copepod into the hydra’s gullet, I have released the anchor hooks so that the diving bell is now drifting freely within the predator’s stomach. Through the portholes I can clearly see cells lining the hydra’s stomach produce a caustic soup of digestive chemicals and enzymes. The crustacean is beginning to dissolve. My litmus-o-meter is reading a rapid rise in hydrogen ions outside, indicating that acid is building up quickly in the hydra’s stomach. I believe that the stomach lining excretes acid, which digests the meal. As the crustacean’s soft tissue breaks down, its basic molecular nutrients are absorbed into the gut lining, completing the process of digestion. But there is a problem for the hydra: the copepod’s protective shell is not digestible. How does hydra manage the indigestible exoskeleton? Further observation into this digestive dilemma is cut short when the diving bell’s chemical alarm rings! The hydra’s stomach acid is beginning to dissolve the bell’s hatch seals (made of frog slime) – and if it does, it will digest me as well! “She is signaling!” calls out Gyro. Just a moment earlier we were observing Lyra’s progress from the Cyclops. The diving bell was clearly visible through the thin dermal layers of the hydra, the copepod dissolving before our very eyes, and then Lyra’s semaphoric flash signaling an emergency of some kind. “Pull her out of there – but gently,” I instruct Gyro. Cyclops inches forward, slowly taking up the slack in the tethering cable. In a moment the cable becomes taut, but fails to pull the diving bell out of the beast’s throat. Gyro gives me a puzzled expression. “…the same way!” shouts my exuberant steersman. “And here she comes!” heralds Gyro. Before our eyes, the hydra disgorges the now chemically scoured shell of the digested copepod, and the diving bell with it. Minutes later, Lyra is safely aboard the Cyclops. She comes to call in my small study where I am rendering the hydra’s capture of the copepod in pen and ink. “I’ll tell the men,” she said, her eyes distant. “Is everything all right?” I ask softly. “I wasn’t ready… didn’t expect to feel… I guess I am saying that I’m going to miss this,” she says, forcing a brief smile. I know what she means. The micro world, despite all its perils, has become our world – and the Cyclops our traveling home within it. Leaving behind so much beauty and life is difficult to accept. “I’ll fetch the bourbon,” she adds, leaves me alone in my study, closing the door behind her. I turn to the porthole above my tiny writing desk. I press my nose to the thick cool glass. The deep infinite of immeasurable liquid blue-green-amber stretches to an impossible horizon… and I feel like leaving it will shred my heart to tatters. This entry was posted in aquatic micro life, Novel Blog, Pond life, wetlands ecology and tagged coelenterates, hydra on September 9, 2018 by Eric. Vorticella never lie… will be etched upon my grave – if this day plays out the way the last hour has been going. 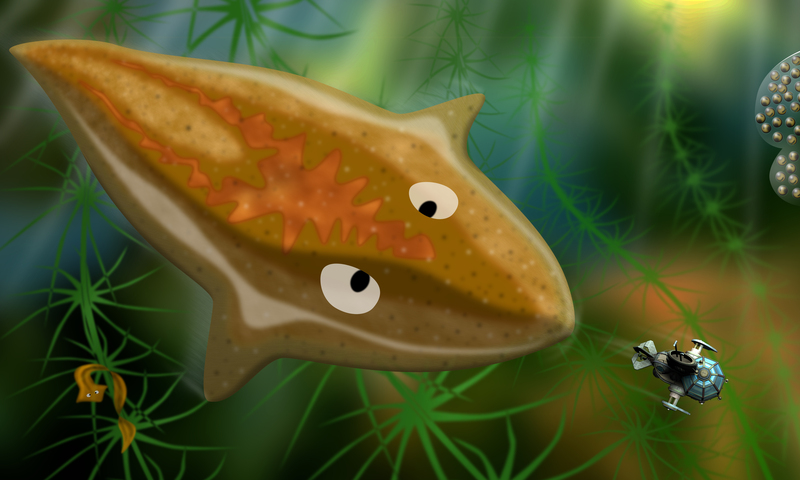 We quickly learn what alarmed the stalked ciliates… a planarian! This predatory flatworm has caught our scent – probably sensing the carbon dioxide from Cyclops’ engine boiler exhaust. “As a wise man once said: you can’t outrun a planarian,” warns Lyra in an analytical tone that defies the peril we were in. We have been trying to evade this denizen of the aquatic weed forest for the better part of an hour, but to no avail. We can neither outrun it, nor out-maneuver it through a maze of water plants and bottom detritus. At every turn the flatworm sways its enormous head from side to side, using its ear-like chemical detectors to track our every move with uncanny precision. I fear that unless we find a way to distract the monster – and soon – we shall become this planarian’s afternoon snack! The helmsman stomps his foot. “But if we shut down the boiler, we come to a stop, and that thing eats us whole!” argues Gyro vehemently. I am moments from making a fateful decision – the command to abandon ship. I am reasoning that when the planarian captures the Cyclops, we will have a moment or two to escape in diving suits, or alternatively crowd the lot of us into the diving bell, which is hopefully too small to interest the predator. But such an escape comes with harsh consequences, for without Cyclops we will be without protection, oxygen, or food, and our survival in this life-rich micro habitat most uncertain. “Changing course,” acknowledges Gyro as he turns the ship’s wheel gently, moving the Cyclops onto an arc-like path that will bring us to a point three millimeters away from the snail embryo mass in less than ten seconds. “The planarian is following, just as we hoped,” reports Lyra. Gyro moves the engine telegraph lever to neutral. The ship slows. Momentum shoves all hands forward. “Jonathan, why are we slowing down? It’s almost on us!” shouts Lyra. The snail embryos, writhing and squirming in their clear egg sacs, loom close off the port bow. I’m not sure how I feel about sacrificing these small molluscs to the planarian so that we can escape, but I know that escaping is preferable to being devoured. Less than a stone’s throw astern the worm wags its enormous head, seeking the strongest signal that indicates an easy meal. Will it be us, or the baby snails? “Here we go!” announces Gyro as he shifts the engine telegraph to full forward and throws his entire body into spinning the ship’s wheel to starboard, using all of his strength to hold it into a hairpin turn, fighting the resistance of the rudder. 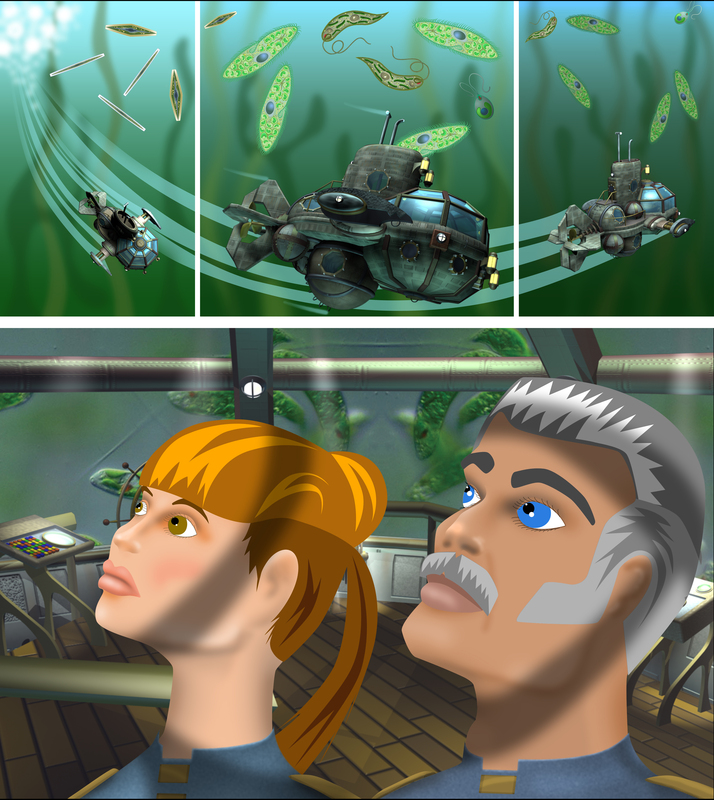 The momentum of the sudden course change pulls on everything aboard the Cyclops, and every micron of her iron hull. I can hear the complaint of metal from all parts of the sturdy ship, and a groan from Gyro whose whitened grip cannot hold the wheel through a turn this tight for very long. I jump to his side and grasp the wheel, my hands beside his. The resistance from the helm is unbelievable. The wheel threatens to throw the both of us across the pilothouse. The control cables surely cannot take this for much longer. The deck under our feet trembles and a shudder of protest shakes the Cyclops from bow to stern. “You can do it,” I whisper to the ship. Suddenly, there is a hand on my shoulder, squeezing reassuringly. It is Lyra. She is smiling. We withdraw to a safe distance to observe the fascinating yet gruesome epilog of our adventure with the flatworm. From the planarian’s underside emerges a muscular feeding tube, which methodically begins devouring the baby snails, one after the other, as if they are some irresistible escargot bonbon. The feeding tube has a mouth-like opening that swallows the baby snails shell and all, then takes them into its body where they digest in a tri-branched intestine that runs the length of the beast. With somber relief I make notes and sketch my observations of this savage feeding process, grateful for our sakes that human ingenuity prevailed again. And as the flatworm feeds, and the baby snails digest within it, I am reminded of the truism that where the choice is to eat or be eaten, nature doesn’t give a tinker’s damn. This entry was posted in Novel Blog, Uncategorized, wetlands ecology and tagged adventure, dugesia, micro predators, planaria, science, science fiction, wetlands ecology on August 20, 2018 by Eric. Microscopic Monsters – The Age of Discovery, Chapter 15: Lights, Camera, Action! The celluloid is rolling! We are now several days into the production of a moving picture documentary. When complete, our film will feature the numerous kinds of microscopic organisms found throughout the pond. The recent acquisition of several oxygen-producing algal protists has extended how long we can remain submerged, allowing for lengthier observations… and more time to “get the shot,” as they say. 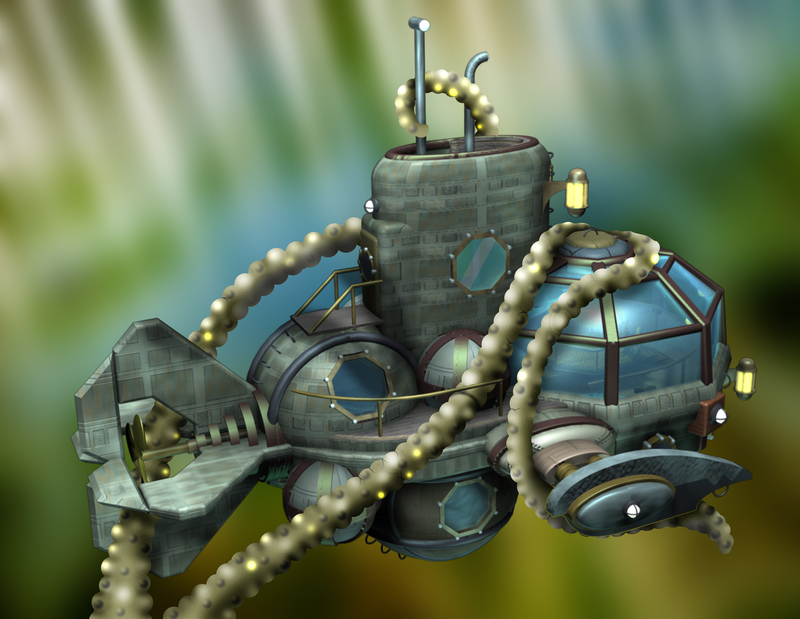 We are currently navigating our way through the dense and occasionally treacherous weedy shallows – treacherous because navigation is more difficult, and one never knows what micro-denizens may lurk in the shadows of this aquatic jungle. Because of the abundant aquatic plant life and plentiful sunlight, this region offers safe haven for a rich diversity of microorganisms. Again and again we see, whilst filming, the relationship between hunter organisms – and organisms that graze. The hunters, or predators, capture and devour the grazers, in much the way the lion feeds on the wildebeest. The grazers, or prey, do not hunt. Most are green photosynthesizers that make their living harvesting energy from sunlight. And those that do not use photosynthesis as their mainstay glean decomposer bacteria from rotting leaves and decaying micro animals. The compelling study of the relationships between predators, prey, and the environment that supports both is the discipline of Ecology. We are deep into the weedy shallows now. Lyra has enthusiastically embraced the photographic survey of our voyage, and these past few days can often be found behind the camera. As the ship steams at meager docking speed, the jungle moves slowly by. All hands are quiet, content to observe the richness of life streaming past the ship, with something akin to awe, or even reverence. The only sound for several minutes is the whir of film moving past the shutter of the prototype British Aeroscope motion picture camera. We are encountering so many new organisms that the camera is rolling constantly! We spy a type of algae made up of cells that connect to each other end-to-end, creating extremely long strands, like hair. The green chloroplast in these cells is spiral shaped, which likely allows it to receive sunlight for photosynthesis no matter where the strand is drifting in relation to the sun. Nearby we photograph a busy cluster of spherical green colonies. The individual green cells have two flagella each, similar to the species that we now tend aboard ship for oxygen production. These spheres are able to keep their small colony of sixteen cells facing the sun for efficient photosynthesis. And then a big surprise – a ciliated microorganism that walks! This beasty patrols stems and branches of pond plants, hunting algae. 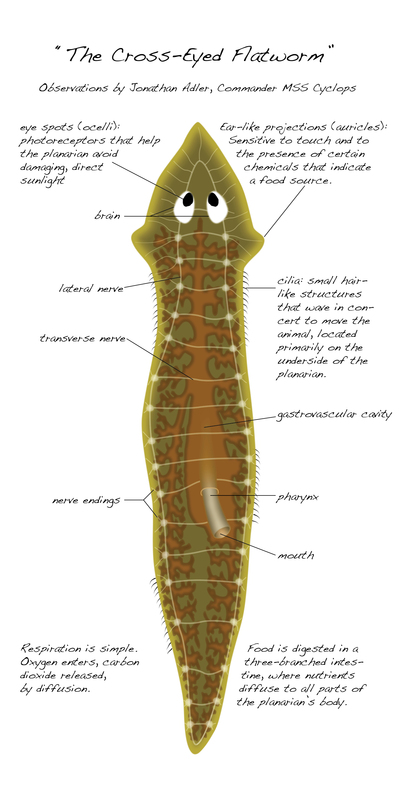 Its legs appear to be specialized cilia that are fused into limbs, and more cilia that create a feeding vortex. Diatoms surround us! It’s hard to believe that just a few days ago we had to move heaven and earth to get enough oil from these glass-encased algae cells to resume our voyage. Diatom glass, like all glass, is made of silica. I cannot help but wonder where might the diatoms extract silica for making their glass houses? Equally as fascinating as its glass enclosure is how a diatom buoys itself to hold position at the best depth for photosynthesis; it does so by producing those lighter-than-water oil droplets. And oil, we know, is very high in carbon. From where, we wonder, do they get the carbon – and how might they synthesize oil from it? Some time back we discovered many uses for diatom products. 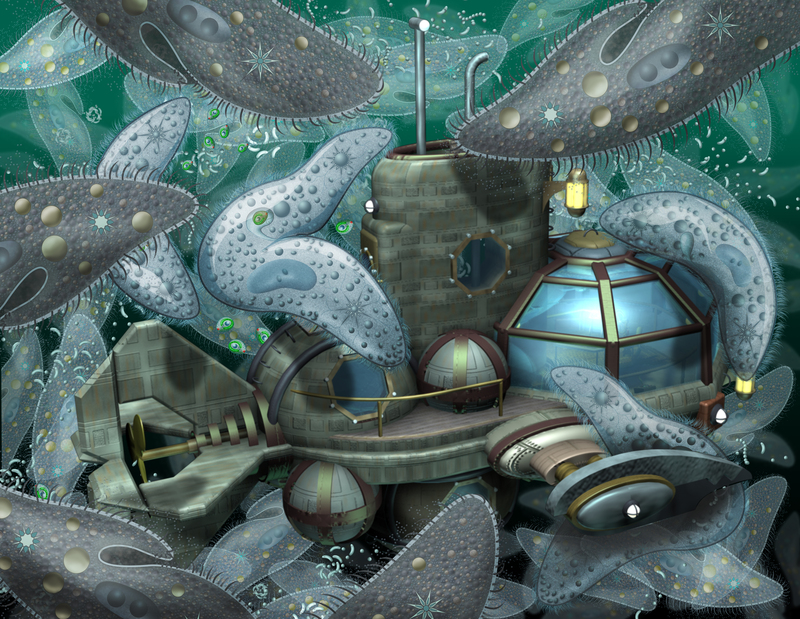 Aboard the Cyclops we repair windows and portholes with glass harvested from diatoms. We use the oil droplets for fuel and machinery… and as a surfactant when necessary to negate surface tension. In the weedy aquatic jungle there is a thriving variety of the class diatomatae, some green, and some yellow – but I must tell you that the chloroplasts from all varieties of diatoms make a delicious salad! It is fortunate that we are filming this abundance of Kingdom Protista, because memory alone could never serve as adequate record of our observations. Life, and movement, is everywhere we direct the camera. But how do these free-living single-cell organisms move about? Our film has revealed that all independently living cells fall into one of three groups, generally based on how they get about. 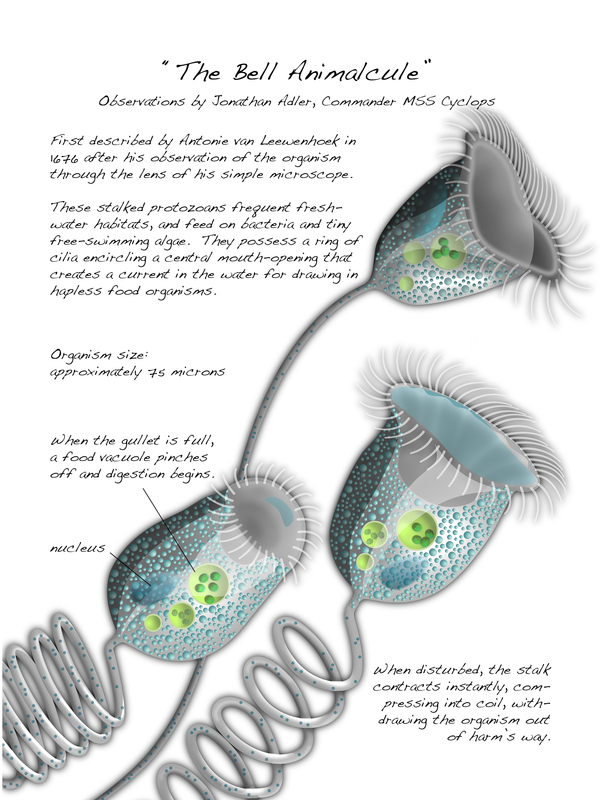 The Amoeboids: Amoebas and their relatives move by extending blob-like appendages that flow like living putty. The Flagellates: A long whip-like strand, or bundle of strands, wave rapidly, pulling the cell through the water like a propeller. The Ciliates: These cells are usually covered in a coat of small hairs that move wave-like, in any direction, to move the cell. Ciliatea is the most diverse Class of Kingdom Protista. Some have cilia adapted for walking, others for feeding. 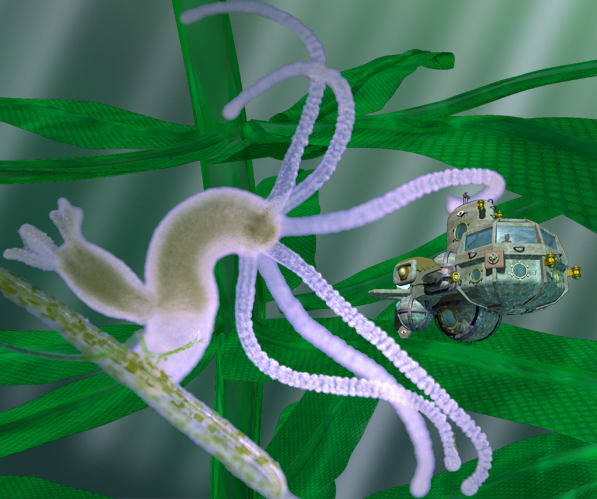 Ciliates are the speedsters of the microscopic world, and most are much faster than the Cyclops at full-steam! We’ve just now observed a most amazing ciliate that tethers itself by way of a spring-loaded stalk! This is the very same protozoan we observed thriving among the aquatic rootlets beneath Duckweed Base, at the beginning of our historic voyage. I have been eager for the opportunity to study this fascinating genus more closely, and my chance has finally arrived. When a disruption, such as a predator comes near, the cell instantly retracts the stalk, affectively jerking itself quite suddenly out of harm’s way. After a time the stalk relaxes and extends. With danger no longer present, the cell resumes feeding – a process of drawing in small algae and bacteria that become caught in its whirlpool-like feeding vortex. “It is the Bell Animalcule,” proclaimed my young naturalist from behind the camera, “but today they are known as Vorticella.” From the safety of the observation deck, she has been filming a colony of these stalked protozoa for several minutes. “They were first observed by the inventor of the light microscope, Antonie van Leeuwenhoek, in 1676,” Lyra proudly recites, “and were later named by…” but before she can grace us with more fact-filled biology history she gasps and focuses her lens on a new development outside – we have been blessed by fortune to catch one of the vorticellids in the act of reproducing! “You say it’s doing wha…what?” asks a blushing Gyro. “Is that what they do instead of…?” ponders Gyro aloud, stopping himself mid-thought. All hands are intently observing the newly anchored daughter cell and the crowded cluster of adjacent vorticella, when without warning every individual retracts lightning-fast on its stalk. “What happened?” shouts a startled Gyro. “Something triggered their danger-avoidance response,” answers Lyra, as a shadow passes over the brightly lit vorticella colony. And suddenly, I am struck with a foreboding sense that our own demise may be at hand. This entry was posted in Uncategorized on August 6, 2018 by Eric. Dawn is breaking. Last night we anchored the ship to a decaying aquatic weed stem, about two hundred twenty centimeters depth – all hands glad for the respite after our adventure on the surface. I am pleased to report that the night passed uneventfully. As I enjoy my mug of coffee on the observation level of the pilothouse the faceted dome reveals the first sunrays piercing the pond’s depths. Through the heavy leaded glass warm watery light strikes green algal protista, which illuminate into iridescent emeralds. And there are thousands upon thousands of them all around us, creating an ever-changing green waterscape that extends in all directions to the furthest distance. The harmless multitude is to other single-celled pond organisms what grass is to the herding beasts of the African Serengeti – food in abundance. I am admittedly curious about the organisms that rely on this plentitude. “Good morning, Skipper,” says Gyro cheerily as he enters the pilothouse. The green algae cells cavorting hither and yon were a clue that we were in the midst of an active food chain. I was eager to unfold its secrets as the sun rose higher. Gyro sends two bells on the engine telegraph to Barron back in the engine room. Through the deck I can feel the vibration of our steam turbine increasing, then a slight surge as the screw begins to spin, the almost-imperceptible shudder through metal and glass as the steam engine gains speed. Through the glass of the observation dome I can see our overnight anchorage sliding astern. We are underway. We are entering a transitional pond microhabitat, not yet definable as shallows, and yet not as fathomless as the open water. 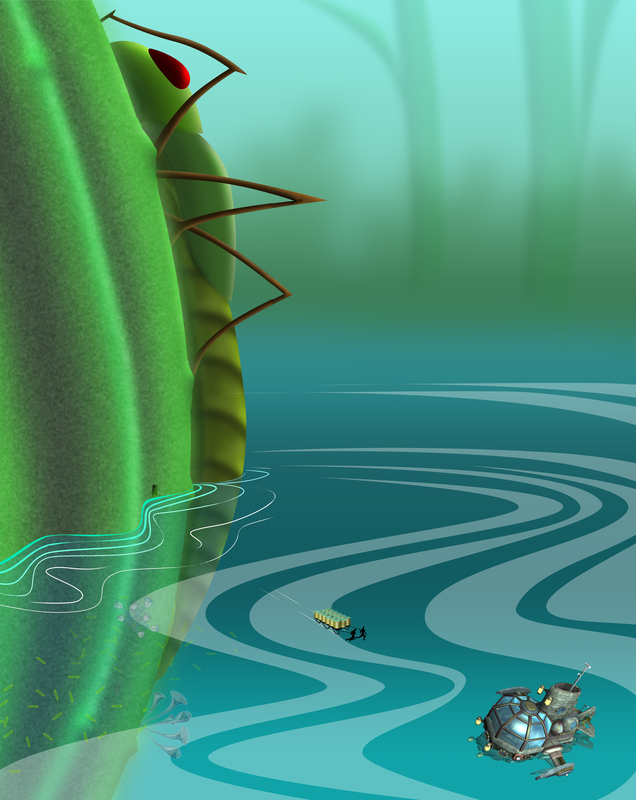 Cruising at slow speed near the surface, the Cyclops encounters a large single-celled organism common throughout the pond – Paramecium. This particular species is different than the others we have seen, it’s color being the most obvious differentiating attribute – it is green! A closer inspection reveals that the green coloring comes from smaller green bodies inside. And these smaller green bodies are organisms themselves – algae cells – not dissimilar from the free-swimming algae cells that are so plentiful in this region. The green cells inside do not appear to be the paramecium’s breakfast. We wonder what function they serve, or if their home inside Chez Paramecia is simply a safe place to live, out of harm’s way. And if so, how might the paramecium benefit from this curious living arrangement? 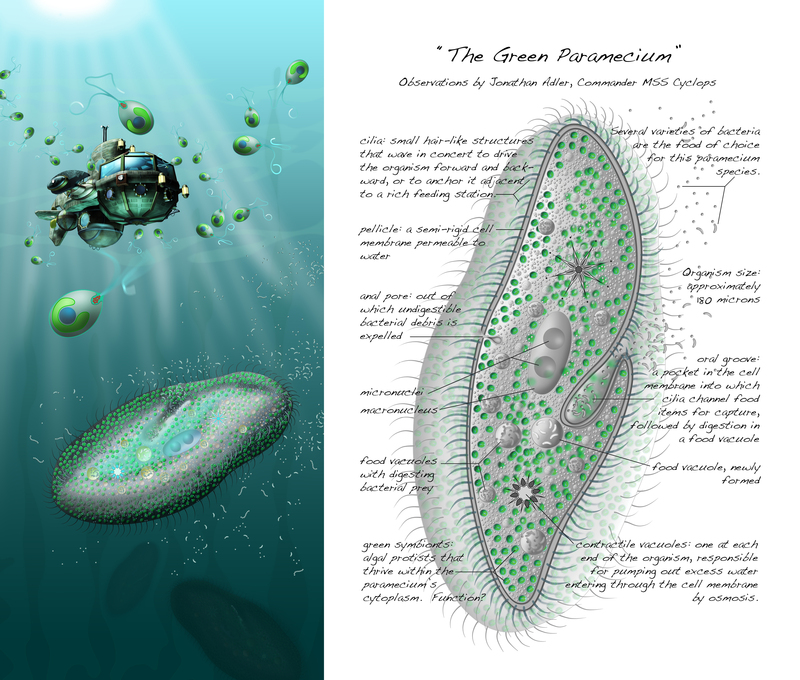 Now this is curious – when we pass over the green paramecium, the Cyclops’ shadow blocks the light from hitting the organism – and to our astonishment, the organism immediately moves back into the sunlight! Could the paramecium be moving back into the light for the benefit of its little green guests? We have observed that green microorganisms gather in sunny patches throughout the pond. Further observation is needed to learn the connection between green organisms and sunlight. As has been the case all morning, single-celled algal protista abound, now perhaps more than ever! Without warning Gyro sounds the bubbles above alert, and for good reason! Oxygen bubbles, found wherever there is a large algae population, are a particular nuisance. “Bubbles above! Bubbles above!” shouts the steersman. In much the same way Cyclops was recently stranded on the surface of the pond, we could easily become ensnared by air bubble surface tension and find ourselves unable to escape. We must avoid these oxygen bubble rafts at all costs, but at the moment, as the bubble raft expands down from the surface, we are in peril of becoming trapped! I glance at the oxygen tank indicators while watching the looming bubble raft now less than a ship’s length above us. The gages show a full store of oxygen. Hurry, Barron! No sooner do I impatiently think of my engine master, than do we hear the sound of metal pipes creaking as water rushes into the holding tanks. Oxygen streams out the stern release ports. The O2 level indicators drop from ninety percent to less than ten. The floor sinks beneath my feet as Cyclops drops safely away from the treacherous bubble raft. “That was close!” exclaims Lyra. This entry was posted in Novel Blog, Uncategorized and tagged adventure, ecology, micro life, microorganisms, microscopicmonsters, microsopic, paramecium, paramecium bursaria, pond life, science, science fiction on July 19, 2018 by Eric. Microscopic Monsters – The Age of Discovery, Chapter 11: Run! Seeing Barron Wolf’s hulking silhouette standing before us back on the upper level was a welcome sight. The big man wrapped his huge arms around Lyra and I simultaneously. We eagerly exchanged tales: Lyra and I, the remarkable story of our trip down through the plant, of the amazing discovery of the already-harvested diatom oil, all that we would need, packaged and ready for us to transport. Barron regaled us with his thrilling account of the tidal wave, and that of the rush-climbing aquatic insect, which continued to cover the doorway. In the end, the process of hoisting the diatom oil canisters up the vallecular canal to the upper platform took three trips using Barron’s hemp rope elevator system. Lyra, Barron, and I worked quickly, buoyed by a warm afternoon light that filled the chamber with a reassuring glow. We were transferring the final load from the lift when the door-blocking insect began respiring rapidly. Heat radiated from its body. Through its translucent abdominal wall, lit from behind by the sun, we could see an arterial network swelling with circulatory fluid. With a sudden rasping of its barbed legs, the insect was gone. Our door to the outside was no longer blocked. Unfiltered light streamed in. Visible through that rectangular portal, Cyclops was resting on her keel across a short expanse of glassy impenetrable water – and what a joy it was to see her undamaged. From the chiseled–out hallway Barron revealed a plank-like sledge, evidently made from a cellulose lath he’d scavenged from the upper platform. “Now if we only had a microscopic mule team,” he added. “Our own strong backs will have to suffice,” I said, and began fashioning a simple harness and towline. “Besides, the exercise will be good for us.” Neither Lyra nor Barron offered any response. With ourselves as beasts-o-burden, we began dragging the oil across the solid plain from the rush to the ship. Glide runners fashioned from Barron’s ingenious use of two S-shaped micro fibers provided near frictionless contact between the sledge and the aquatic interface. Once set in motion, the loaded sledge slid easily, as if on ice. As we approached Cyclops, Gyro ran out to greet us and assist with the labor. The young steersman was evidently eager to reunite with the crew. He gave his own colorful account of his exciting ride on the tidal wave. With his help we were soon alongside our sturdy ship, unloading the oil canisters from the sledge. “Barron, do we have the equipment for that?” I asked, already guessing the answer. From the glassy surface around us, pupae continued to surface and hungry adult insects emerged. I was relieved to hear that Barron had worked out a fast way to distribute the oil and that we would soon be underway. “Run!” shouted someone, although now I’m unable to recall who it was. A shadow passed over the sun, shading the stranded Cyclops and an area several millimeters around it. Looking back over my shoulder the sky had disappeared, replaced by the massive compound eyes, mandibles, and the slathering mouth of a monster. It was our friend the no-see-um, and she was hungry. This entry was posted in Novel Blog, Uncategorized and tagged adventure, microscopic, microscopicmonsters, science, science fiction on May 2, 2018 by Eric. With each arm’s length of hemp line released I watched Captain Adler and Lyra slowly descend and disappear down the dim interior of the plant’s hollow shaft. I had let out about one and a half centimeters of the rope when the resistance suddenly ceased. Attached to the block, the fishing bell alarm made no sound. I could only assume that the skipper and Lyra came to rest somewhere down there, hopefully at a depth where they might easily collect and harvest the diatom oil that we need to get back to our mission. Had I been granted more time to prepare for this excursion it would not have been overly difficult to rig a telegraph or a simple voice pipe to allow for basic communication between myself and the descent team. But as I am reminded constantly by gigantic insects emerging all around us, time was short. The fishing bell would have to suffice. I secured the line to a pike anchored deep into the plant tissue, and withdrew from the cathedral-like interior. Green illumination gave way to daylight as I passed through the carved entrance hall and stepped back onto the impenetrable liquid of the pond, a consequence of physics at this micro scale to which I shall not ever become accustomed. I glanced momentarily across the water to Cyclops, still resting awkwardly at an angle, her weight causing a slight dent in the otherwise featureless surface. Our ship, our home, looked both clumsy and vulnerable, imparting a sense of urgency – getting her below the surface and under steam again was critical not only for the mission, but for our survival. In the pond-scape beyond the ship I could see nothing more than a meter distant, at which point the world blurred into a green blue haze – the fringes of the visible micro verse. In a heartbeat my senses became heightened. Something set my awareness afire – a momentary darkening of the sky, like a passing shadow. This was followed by a sound, or a sensation… the report of a collision of some kind, an impact event for certain. Then I saw the wave, a thickening line materializing on the blurry pond horizon beyond Cyclops. It crawled up the sky, millimeter by millimeter. It was easily ten times the height of the ship when I turned and sprinted for the rush portal. I glanced over my shoulder just once and saw the wave lift Cyclops higher and higher, up and over its smooth summit. In the next instant the water beneath my feet was rising, sloping upward behind me. I reached the door through the outer skin of the rush and dove inside. The wave struck. The rush bent. I braced myself against the carven inner corridor. The wave rose up and over the portal as it swept past the plant. Instinct told me that water would come pouring into the carved entrance, but it did no such thing. The water bulged inwardly like a hand reaching for me, but the same physics that had stranded us, now prevented the water from entering that microscopic space. In the next moment the water withdrew and the rush steadied. I hoped that my colleagues down below were safe as well. I moved quickly to the outer portal to see how Cyclops had faired. She had come to rest several millimeters from her earlier resting place, but seemed undamaged. Gyro was outside the ship, apparently performing a post-wave inspection. He waved. I returned the gesture, but did not immediately notice that he continued waving, and somewhat enthusiastically. A rasping sound, like wood against stone – scratching and grating, resonated through the walls of the plant, becoming louder – closer! When the sound reached an almost deafening volume, a monstrous insect easily ten times the size of the Cyclops, burst from the water in front of me as it clambered up the rush. I staggered back into the entrance hall, felt a warm wind from the animal’s fluttering gills as it clambered up the plant. The monster came to a stop, completely blocking the exit portal. A section of its pulsing abdomen filled that rectangular incision. I had a perfect view of its geographic network of veins, arteries, and lymph, all visible through the translucent exoskeleton of its belly. But now my only path of egress was blocked. Ting-a-ling, reported the fishing bell – finally! Excitedly, I returned to the vertical shaft. The hemp line was being yanked repeatedly from below. Here was the signal I had hoped for. I unfastened the anchor knot and began the arduous hand-over-hand retrieval of the explorers. This entry was posted in Uncategorized on April 17, 2018 by Eric.